With almost 35 years of combined military service, El Reno attorney Fletcher D. Handley, Jr. retired from the Oklahoma Army National Guard, effective January 9, 2008. 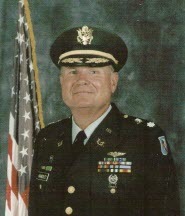 Lieutenant Colonel Handley began his military career in 1966 as an Air Force ROTC cadet at the University of Oklahoma. He enlisted in the US Navy in 1969 and spent four years on active duty, attaining the rank of Petty Officer, 3d Class. After attending Anti-submarine Warfare school in Norfolk, Virginia; and Flight School in Patuxent River, Maryland, Handley was assigned to Navy Patrol Squadron 11, in Brunswick, Maine, as an airborne Radar and ECM operator aboard a P-3 Orion aircraft. He flew over 1000 hours and completed numerous tours of duty throughout Europe, the Mediterranean and the Caribbean, before completing his active duty in 1973. Handley was honorably discharged from the Navy in 1975, and enlisted in the Oklahoma Army National Guard in 1981. After attaining the rank of Sergeant E-5; Handley accepted a direct commission as a First Lieutenant in the Army Jag Corps in 1983. Progressing through the ranks, he served as trial/defense counsel in the 45th Infantry Brigade, and as Staff Judge Advocate of the 45th Troop Command. He completed his career at Joint Force Headquarters in Oklahoma City, where he served for several years as the Deputy State Judge Advocate for Oklahoma and was assigned as Military Judge. He was honored at a retirement party in October of 2007 in Oklahoma City, in anticipation of the January deployment of many comrades to Iraq. At that ceremony, he was presented the Army Meritorious Service Medal, and an officer’s Silver Sabre inscribed with his name and rank. Those attending the ceremony included Brigadier General (ret.) Thomas Walker of Ardmore; Colonel Kyle Goerke of Watonga; Air Force Colonel Lynn D. Fees of Kellyville; Chief Warrant Officer Mark Mishoe, of Edmond, and many other current and former members of the Oklahoma Army National Guard JAG Section. In his civilian life, Handley has practiced law in El Reno continuously since 1978. He was a member of American Bar Association Standing Committee on Armed Forces Law, 2001-2004; and the ABA President’s Working Group for Protection of the Rights of Service Members in 2004. Ashton Handley is a US Navy veteran of the Second Gulf War. A graduate of the Defense Language Institute in Monterey, California, he is a certified Russian linguist. Ashton achieved the rank of Petty Officer, Third Class. He deployed to the Gulf with the First Marine Division aboard the USS Boxer, where he was assigned to the Quartermaster. Ashton was awarded the Navy & Marine Corp Achievement Medal, along with the National Service Defense Medal, National War on Terrorism Medal and the Navy Expeditionary Medal. He was honorably discharged in 2007. Alex Handley served in the Navy Reserve. While in school, Alex was a member of the United States Navy ROTC program and was commissioned as an officer by Senator John McCain in 2004. Prior to commissioning, he served as a midshipman in Operation Iraqi Freedom onboard the USS Nashville (LPD-13) in the Persian Gulf during the summer of 2003. He was honorably discharged from the Navy Reserve in 2012 at the rank of Lieutenant. The Handley Law Center represents service members in a variety of matters, including family law, criminal law, real estate and probate, all at reasonable rates. We have also successfully represented dozens of service members before various military boards and court-martials.